roots, he moved to Switzerland as a teenager. Trained as a classical musician with the Music School of Zürich, Leo and his brother Roberto opened the Salsacademy Dancing School in Zürich in 1995. After learning salsa dancing on 2 in New York direct from its creator Eddie Torres, Leo introduced the new dancing style in Switzerland. At the moment he is the only instructor of Bachatango Fusion-Dance in the country. Leo Franz organized the first 3 salsa congresses in Switzerland and is considered one of the salsa pioneers of the country. Like every year, Leo will be instructing at the Salsa Festival Switzerland 2012, the salsa top-event in Europe, and one of the leading salsa congresses in the world. Leo Franz has always been active in workshops in Europe and the USA, improving his professionalism, dancing-technique and pedagogic skills to a maximum. 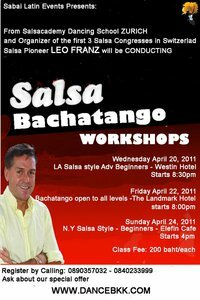 Leo Franz teaches SALSA NY STYLE ON 2, SALSA LA STYLE ON 1, BACHATA, and BACHATANGO.